WEMO Review: Ready To Live Like The Jetsons? Imagine a world where you could have your coffee made for you when you wake up in the morning, the lights turned on just before you get home from work and turn the Crock Pot on just in time to have dinner ready when you get home (or turn it off if you are running late). Thanks to a company called WEMO, this Jetsons lifestyle is now reality, and you don’t have to buy a new coffeemaker or crockpot. Make your existing appliances smarter with smart bulbs, smart light switches, WiFi outlets and more. 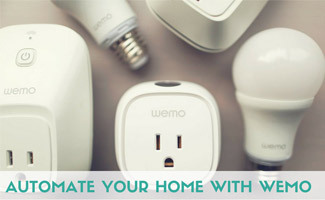 WEMO is owned by Belkin, a company that creates tech accessories and networking gear. Their product line includes smart light switches, bulbs, outlets and more, all controllable through your home’s existing WiFi network. Once you set up your WEMO equipment, remote access is enabled and you can control your devices from anywhere on your iOS or Android device (as long as you have an internet connection). Use the app to turn lights, appliances, electronics and other devices on and off with a smart switch. This can make your home look like someone is home when they’re not or you can even use it to have your coffee ready for you first thing in the morning. All of this and more is possible through the use of your smartphone. To use a smart switch, you plug the switch into your outlet and the appliance/electronic into the smart switch. *IFTTT stands for “if this, then that,” which means you can connect other apps and devices like Gmail, Instagram, Facebook, Amazon Alexa, etc. Users create scripts (aka, recipes), which means if one action takes place for a device or service, it automatically triggers another action for a device or service. An example of this would be if your have Alexa you could have your lights automatically turned on at sunset. Below is the pricing for some of WEMO’s products along with a quick description of what these smart home gadgets do. Is there a WEMO dimmer? No, there is not a WEMO dimmer at this time. What happened to the Belkin WEMO Switch & Motion Sensor? The WEMO motion sensor was discontinued. Below is a sampling of reviews from real WEMO customers. If Lindsey didn’t have WEMO, her house could’ve caught on fire. Find out what happened in the short clip below. Are There Any WEMO Alternatives? What’s your favorite smart home gadget? My neighbor has one of these to turn on and off his lights while he’s gone since he has a cat and I was super impressed he was able to figure it out since he’s not very tech savvy. Think I’m going to upgrade my home and get one too.